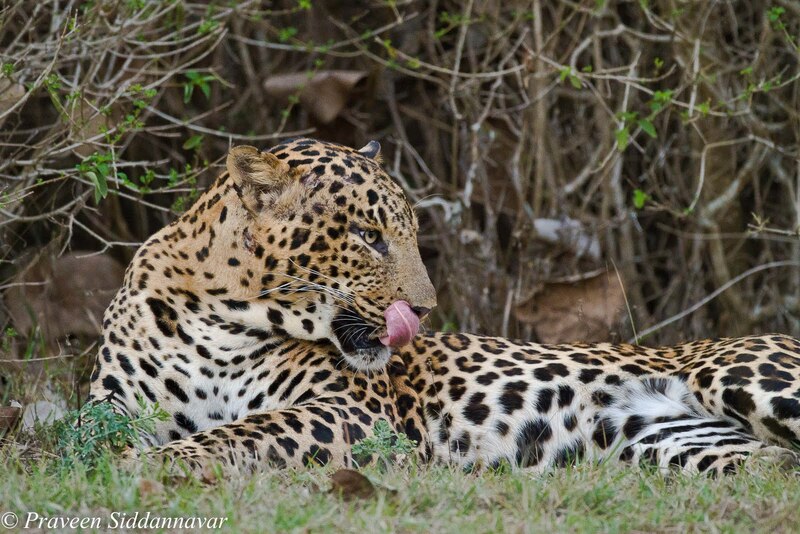 Praveen Siddannavar's Blog: The Elusive Cat of Bandipur! 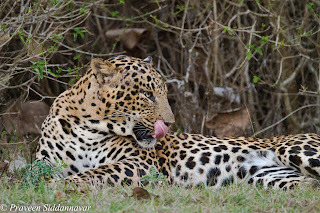 4th March 2011, I along with few of my friends visited Bandipur Tiger Reserve, since most of them were photographers we decided to be together in one jeep & leave a little early. We managed to leave for our evening safari at 3:45pm and our first encounter was with a herd of Elephants that had a calf, so the protective mother not only charged but in a fit of anger she kicked a dry tree stump lying on the ground and it almost hit our jeep. 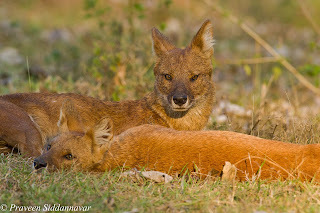 Further the excitement continued and we were lucky to spot & shoot a pair of wild dogs (Dhole).The couple probably had good meal and were in a relaxed mood, the sun was setting and I was fortunate to photograph them in the evening golden light. We continued our ride and later there were no sightings of any animals, also the light was fading and it was almost 6:30pm so we took the 1st mile JD road and headed towards the exit gate. 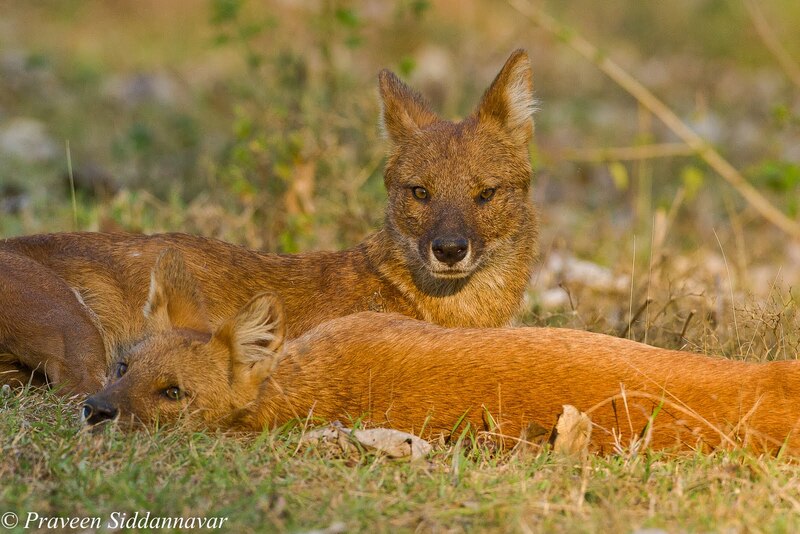 As we were driving we heard langur (black faced monkey) alarm calls, I was sure that a tiger or a leopard is around, we waited patiently and after a while the alarm calls stopped. If the predator is around the langur will continue to give alarm calls, and in this case I guess that predator had moved hence the calls stopped. I was looking through the bushes very carefully as during dusk the tigers or the leopard is on the move. 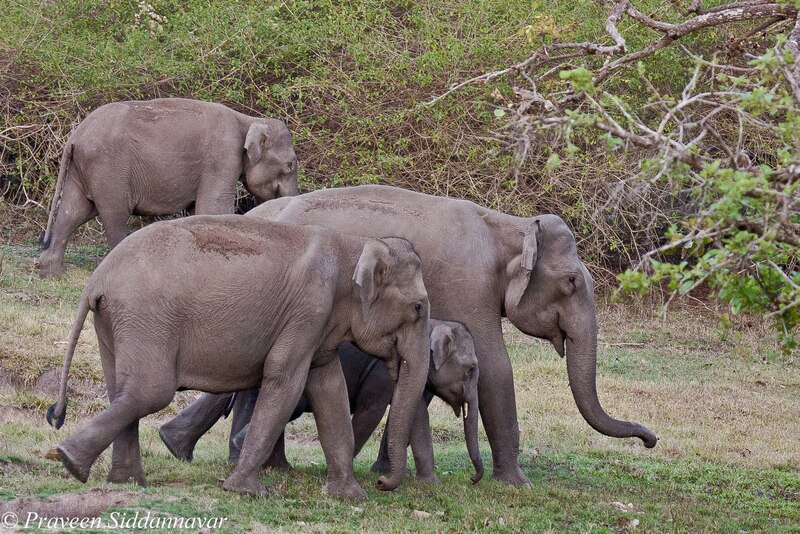 As usual I was in the front seat along with my lucky driver Kiran, my friends were at the rear open top seats along with naturalist Natraj, one my friend Bhargava’s mom too had accompanied and she was inside right behind me. 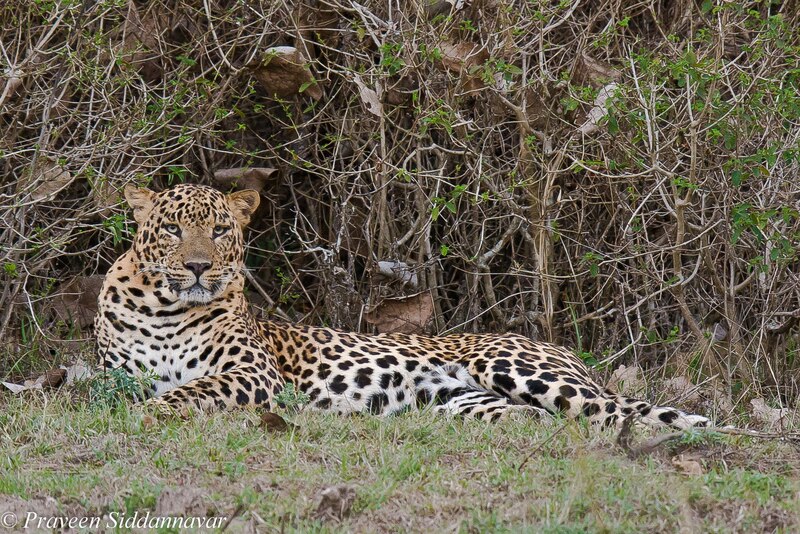 We reached the 1st mile JD road and suddenly to my left I spotted a leopard resting in the open, immediately I asked Kiran to switch off the engine and asked everyone to remain calm. 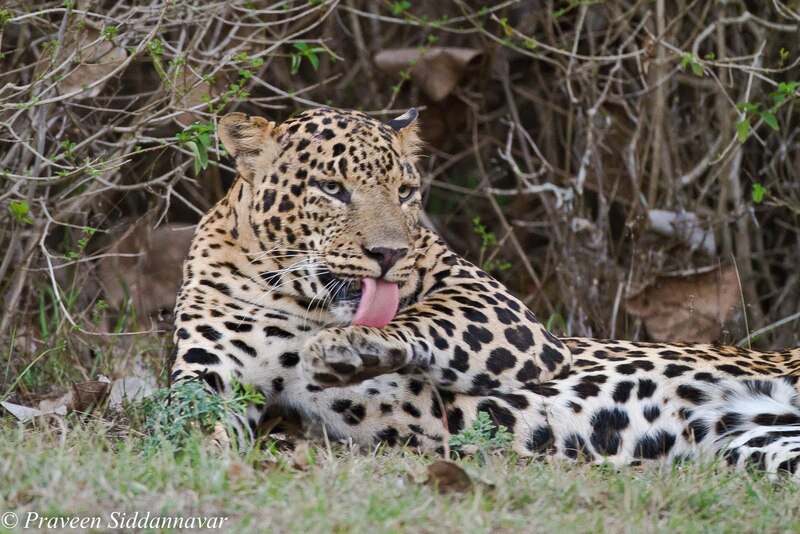 Leopards are so shy even if spotted from a distance they disappear in fraction of a second. And believe me this one was less than 25 meters from our jeep. 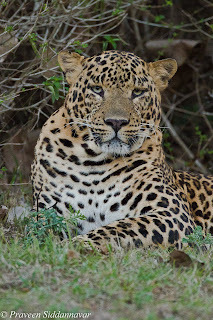 As soon as the leopard saw us it was about to disappear in the bushes but because we maintained pin drop silence and unmoved, it seemed relaxed and settled down. I grabbed this opportunity to shoot with my Canon 7D & 500mm Lens; the light was very low as the time was 6:40pm. I immediately increased the ISO to 1600 setting the largest aperture 4 and took some shots. After 5 mins I further increased the ISO to 3200 and shot few more images. Unbelievable sighting this is I said in my mind and continued to shoot. 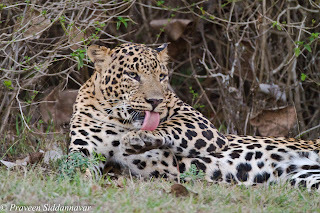 While shooting with 500mm I realized that the leopard was so close that I was unable to get him in full and part of the body couldn’t fit in the frame. I immediately pulled out my other camera, Canon 40D with 100-400mm Lens. 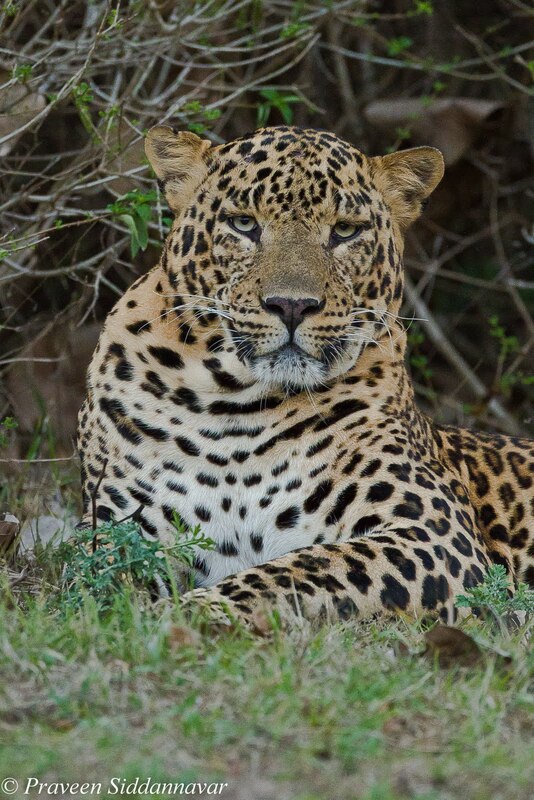 With this I was able to get the Leopard in full. By now we had spend almost 10-15 mins with leopard, so I thought I will try a video that is in-built in my Canon 7D, I pressed the record button and suddenly a forest dept jeep came closer, with the noise the leopard crouched and disappeared in the bushes. Fortunately all this got recorded. 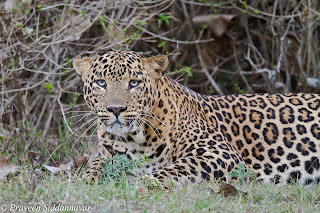 When we returned to the JLR resort, none of the staff at JLR including the resort manager Mr.Gangaswamy couldn’t believe that we spotted a leopard in the open and not only photographed but also that I could take a video. 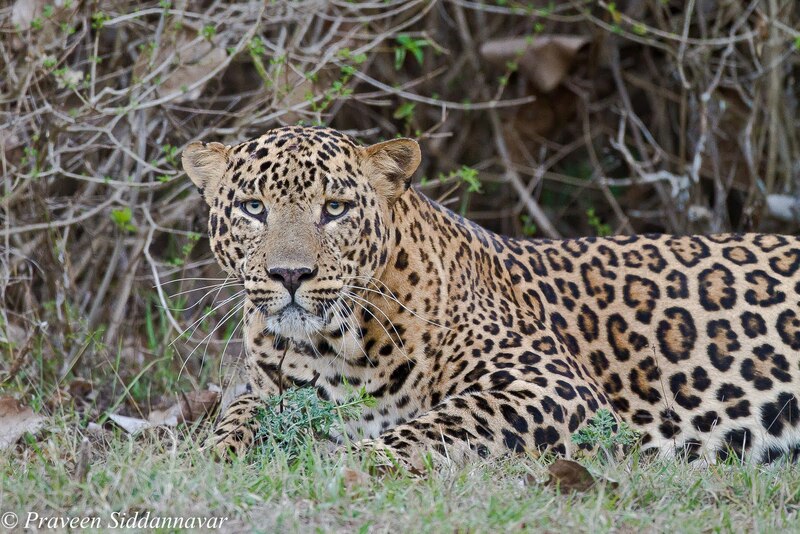 Everyone who visits forest regularly knows how difficult it is to even get glimpse of this most elusive and shy cat. A sighting which we shall cherish for years to come!